ManufacturerStarTech.comManufacturer Part NumberUSB3SDOCKDDManufacturer Website Addresshttp://www.startech.comBrand NameStarTech.comProduct NameDVI Dual-Monitor Docking Station for Laptops - HDMI and VGA Adapters - USB 3.0Marketing InformationThis dual-monitor USB 3.0 docking station turns your laptop into a dual-monitor workstation with flexible setup options. Display Flexibility The dual-DVI docking station adds dual-monitor support to your workstation, with resolution support up to 2048x1152. With more screen space, you can simultaneously access multiple applications and reference material on one display while composing on the other. To ensure the USB 3.0 dock supports a variety of displays, two display adapters (DVI to VGA and DVI to HDMI) are included. Powerful Connections and Fast Device Charging Transform your laptop into a workstation that supports all of your peripherals. 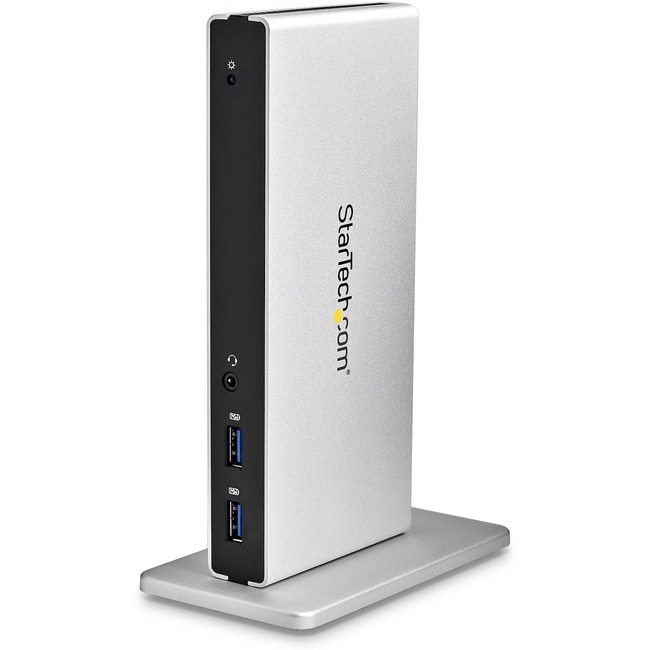 This docking station features five USB 3.0 (USB 3.1 Gen 1) ports. The two front-facing USB ports are USB fast-charge ports (USB Battery Charging Specification 1.2). These accessible ports charge your mobile devices faster than standard USB ports, with or without your laptop connected to the dock. The dock also has a GbE port, headset jack and separate 3.5 mm audio and mic ports, so you'll have all the connections you need. Save Desktop Space You can free up valuable desk space by positioning the dock vertically on your work surface using the included (optional) stand. The USB3SDOCKDD is backed by a 3-year StarTech.com warranty and free lifetime technical support.